Walking on air, in upstate New York Amish country. What do they feed these horses? 28 responses to Levitating Amish horse? Wow, what a neat picture!! Its not really something I have given much thought to or paid attention to before, but do horses and other animals actually have all fours in the air when they are going fast or is this really unusual?? Maybe something scared him? He does look a little side-ways too. Hmmm, interesting! Thanks for sharing the picture Erik!! One of the interesting things about the first motion picture in 1878 was that it shows a horse with all four feet off the ground at the same time. If that buggy were a car, it would be a new Chrysler 300. A different rust color on this buggy, i really like the yellow and white ones myself. Im too tired to even promote anything,lol. I would have done it maybe a little different Erik with a levitating out- house maybe in this post,lol. Richard from the Amish settlement of Lebanon county. I don’t think he is levitating. I think the horse is jumping. It was a matter of controversy in the 1800s, as to whether at a gallop, the horse’s four feet left the ground, or it always had one hoof down. Yes, it does have all four off the ground, as seen here. This must have been taken at a high speed. Either the horse was changing gaits, or that buggy is MOVING! 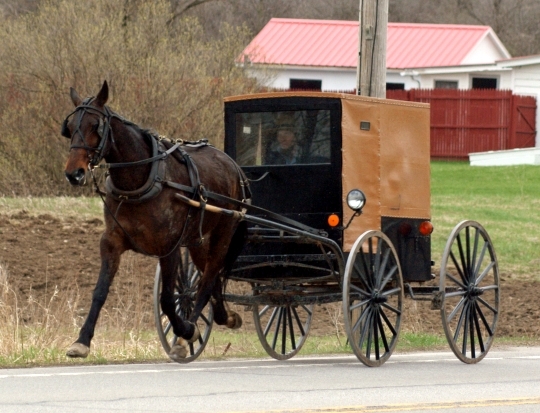 Most or at least many of the Amish use Standardbred horses for the road or buggy horses. Many of them were bred for the track & sometimes they will even use retired trotters off the track. This is especially true in the more northern and eastern states where trotting is a bigger deal than it is in the south, but even the Amish in far South Texas which is about as far as you can get from the trotting tracks, use Standardbreds. Magdalena is correct, it was a big controversy in the 1800’s & in fact that is why the first movies were made; to show conclusively exactly what pattern the horse picked its feet up in a given gait. I read onetime that the very first movie was edited, after the fact, so that the horses hooves NEVER touched the ground … he was trotting entirely off the ground. I have never seen that movie, but I heard that it exists, or did at one time. Al this is from a New York spin-off settlement of the New Wilmington, PA Amish. The New Wilmington folks and their daughter settlements are to my knowledge the only one using this burnt orange/brown color. They originally came out of the Big Valley PA settlement. Great picture. I knew all 4 feet left the ground in a gallop, but didn’t realize a trotter would or could also do this. My new camera has a “burst mode” taking multiple pictures is a second….I’ll have to give it a try. What a fun picture! Love it! I hope everyone has a great memorial weekend, lets remember our American soldiers for their sacrifices. Richard from Lebanon Pa.
That is not trotting ,He is Pacing, if u notice his left front leg & his right back leg work together, Go to harness race track & watch all the horses perform. I am amazed by the fascination with horse movement that would lead to the first movies being made about it…Then again I was fascinated enough to post the photo! And Robin thanks for the link to the film, I just watched it, neat. Rudy’s statement is absolutely correct. I started to say the buggy horse was pacing in my earlier post, but I didn’t think anyone would pick up on such a subtlety. Guess I was wrong. Erik, I think the moving leg motion versus what we perceive the motion to be was the root of the controversy. It LOOKS like the legs are doing one thing but studies of hoof prints in sand or other loose soil indicated something different was actually happening. However, the horse in the vintage film was galloping, the horse in your still was pacing as Rudy pointed out … which is a different gait. Same as your gait is different if you are walking versus jogging. For background on the film Robin linked us to try googling Eadweard or Edward Muybridge. I used to help train. One of my most favorite memories. Thanks Erik. I’d say pacing indeed – my favorite. However, there is one thing that is odd. The buggy is of an older family (note the foot brakes). Horses that pace are typically owned by the younger generation. Apparently this is where the two generations meet. Just an observation I thought about sharing. Val; What type of brakes would a younger generation use? OldKat, none. You won’t find foot brakes on buggies of the unmarried men. The horse in the still is actually trotting, not pacing. A horse moving at the trot produces a diagonal, two beat gait (ie right fore/left rear strike the ground at the same time). A horse moving at the pace produces a lateral, two beat gait (the pair of legs on the same side move forward together at the same time). On the track, these horses are often seen wearing “hopples” to help the horse find the motion of moving the pair of legs together at the same time (horse’s who race without this equipment are called “free-legged” pacers). It’s not at all unusual to find a horse moving “in suspension” at the gallop, trot, or pace–just a matter of timing that shutter. Burnt Orange and Black buggies. Just got back from Amish country Pa. and saw a horse fly by moving side to side. Most of them trot, This one is pacing. Actually, all horses do this. At the trot (pace for pacers), canter, and gallop all horses have all four feet off the ground for a moment in time before touching back down. This lovely Standardbred is trotting (not pacing, notice the diagonal movement of the legs), which is a two beat gait. So if you think about it, the horse must have all four legs in the air for it to keep its speed. Leave a reply to Levitating Amish horse?